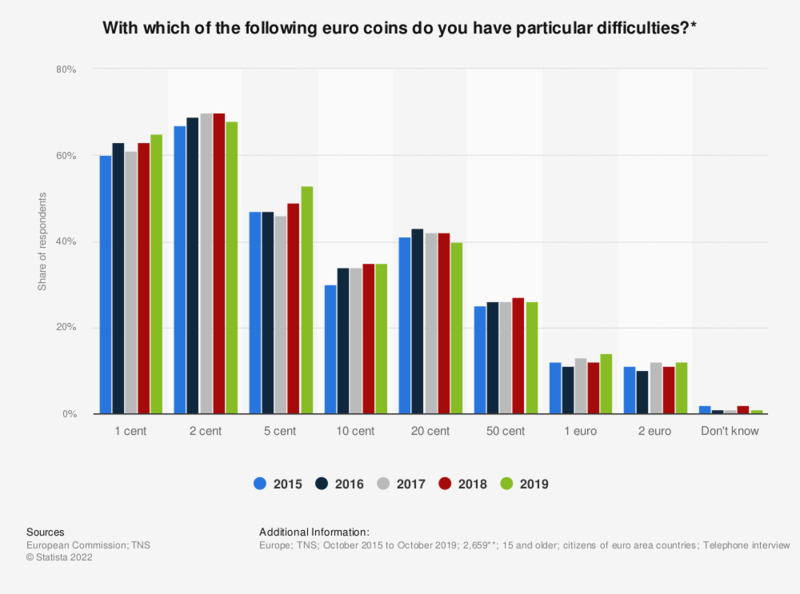 This statistic shows opinions on euro coins, according to the eurozone countries population, from October 2015 to October 2018, listed by the difficulty of use of a particular type of coin. As of 2018, 70 percent of respondents reported that the 2 cent coin was difficult to use. ** The sample size for the particular question. As of October 2015, the euro is the official currency of 19 Member States of the EU: Austria, Belgium, Cyprus, Estonia, Finland, France, Germany, Greece, Ireland, Italy, Latvia, Lithuania, Luxembourg, Malta, the Netherlands, Portugal, Slovakia, Slovenia and Spain. These countries are collectively known as the euro area. Statistics on "The Euro currency"
Generally speaking, do you think that having the euro is a good or a bad thing for your country? Generally speaking, do you think that having the euro is a good or a bad thing for the EU? When you pay cash, would you say that it is easy or difficult to distinguish and handle euro coins? When you pay cash, would you say that it is easy or difficult to distinguish and handle euro bank notes? Today, when you are buying things do you tend to convert from the price in euro to the previous national currency? Today when you are buying things do you tend to convert from the price in euro to the previous national currency? Will adopting the euro mean that your country will lose a part of its identity? What impact do you think the introduction of the euro has had in the countries that are already using the euro? To what extent do you feel informed about the euro? Have you already used euro banknotes or coins? Please indicate whether any of the euro coin denominations should be removed (if yes, which one(s)? Today when you are buying things do you tend to convert from the price in euro to the previous national currency for exceptional purchases? Today when you are buying things do you tend to convert from the price in euro to the previous national currency for common purchases? According to you, is the introduction of euro going to be beneficial or disadvantageous?